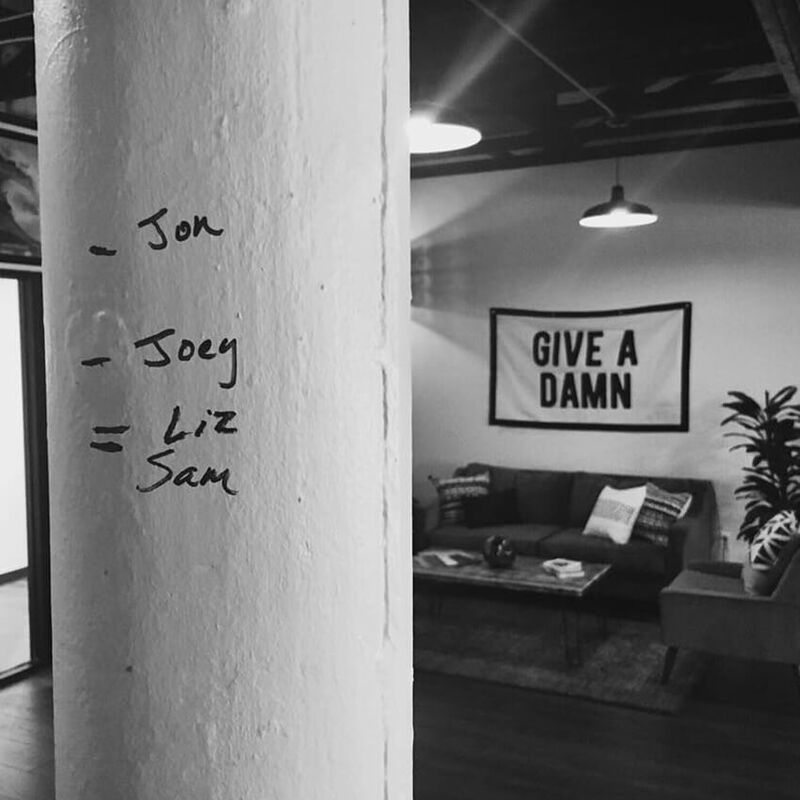 “Give A Damn” is a mantra featured across our website and our office, but what does it mean? In this blog, our co-founder explains exactly what it means to Give A Damn at Evangalist. When a visitor lands on the homepage of our website, they are welcomed with this phrase. When someone visits our office, typically the first thing they see is a large flag bearing this ideal. Time and again, when we’ve talked to possible new clients about the ideas we have to help them attract new fans, they tell us how much our team exudes this concept. Every last one of our clients mentions frequently how much they appreciate that our team lives this moral. This one simple phrase is so easy to say yet so incredibly difficult to practice. We love it and have taken on its essence because of how hard it is to consistently execute, and how much we appreciate those who do it successfully. Our hope is that everyone who comes across Evangalist is inspired to give a damn, to care more, to try harder, and to serve better. We love seeing a business launch a new campaign that breaks the mold in terms of how they’re communicating with their audience. We love seeing an agency announce a new website for a client when it’s obvious that the team went above and beyond, and helped the client establish a whole new level of digital brand equity. Unfortunately, you just don’t see it very often. You don’t always see agencies breaking their necks to serve their clients the best they can both creatively and logistically. You don’t always see brands invest the proper amount of time, energy, and money to serve the marketplace with the type of engagement it demands and, frankly, deserves. People, the marketplace is the lifeblood of all that we all work for. It is the singular force that keeps all of us employed. Without it, we’re dead. If it loses faith in what we offer, we’re toast. If we continue to take it for granted, it will find someone or something else that won’t. When other human beings and entities are either looking to trade their hard earned money for a product, or even more so, when they’ve already handed us their hard earned money in exchange for a service, we owe them our absolute best! Nothing less. So, what does Giving A Damn look like for us? I’ll give you some recent real examples. Giving A Damn is Jon staying on the phone with a client an extra hour in order to help them understand a dashboard they’re having trouble navigating. It’s standing in the parking lot with me 30 minutes after work explaining how he thinks we can improve a campaign to see more conversions. It’s him forgetting to eat lunch because he spent 6 straight hours obsessing over round 1 copy for a client’s brochure. Giving A Damn is Sam spending several hours of her own time on a logo design project just because she couldn’t get it quite perfect within her allotted work time. It’s her doing design work in an outdated and cumbersome platform that the client is used to so that they don’t have to adjust to what’s she’s comfortable with. It’s her showing incredible grace when receiving feedback on a design that she knows is not going to be good, then politely explaining why the client should reconsider without making them feel foolish. Giving A Damn is Liz contacting a technology vendor personally and working through all of the pricing and technical options for a site when that was nowhere within the scope of the project. It’s her coming into the office a couple of weeks ago in a complete visible haze and explaining that she hadn’t slept because she was up all night working on finding a development solution for a client. It’s Liz rejecting me when I tell her to “please just stop working” and she says “I just need 15 more minutes and I’ll be totally done,” and then works another 2 hours on one stinking page of a website. Giving a Damn is Joey being the main point of contact for every client on our roster and making himself available to every single one via phone, text, and email at any hour of any day. 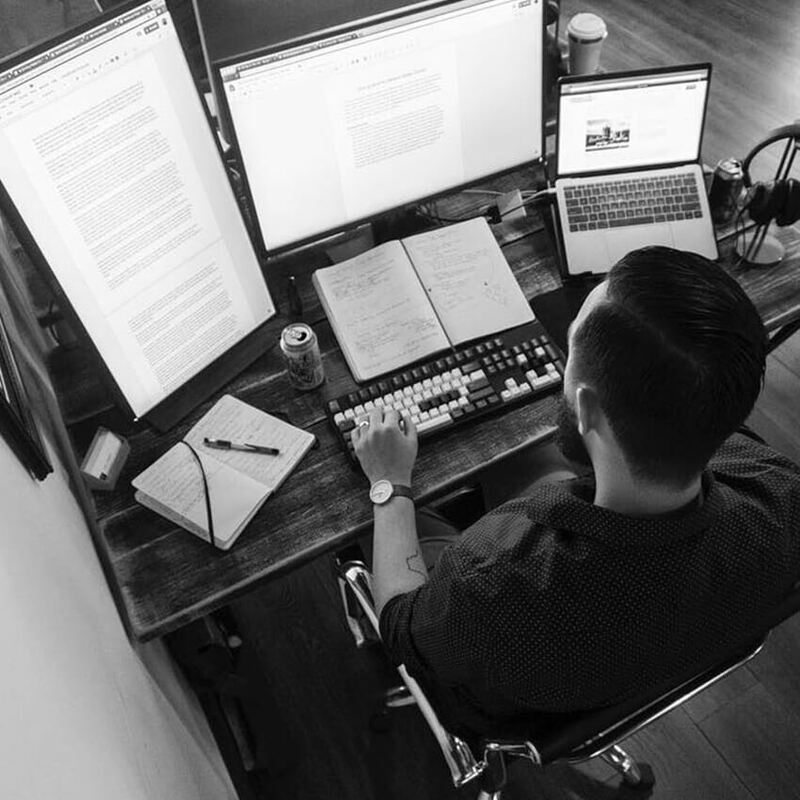 It’s Joey taking on the roles of Project Manager, Account Manager, Official Pantry Re-stocker, Garbage Man, and Morning Coffee-Maker without batting an eye. It’s building our office desks by hand and making a few extra so friends and clients can drop in and utilize our office space as their own. It’s jumping on any necessary task with positivity so we can get the job done for every client. Lastly, it’s overcoming challenges that the rest of us couldn’t imagine overcoming, and doing so without complaining, whining, or asking for sympathy. We also choose clients who Give A Damn. I’ll share a few of those examples too. It’s Stevens Tanker investing a ton of resources in telling the stories of their team members and inspiring young people that often live in the middle of nowhere that there is a path for them to succeed both professionally and socially with a company that will treat them like family. 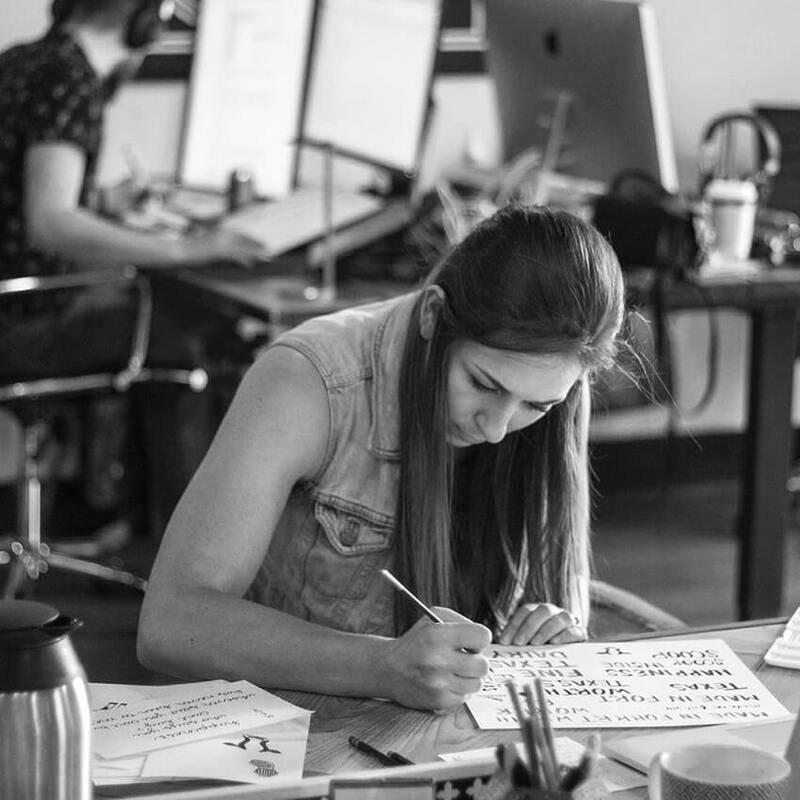 It’s The HR Consultant working with us to create brand new forward-thinking brand assets in order to do their part in breathing creative life into a tired industry. It’s Supply spending a lot of time and money to create a premium buying experience for their customers. Understanding that if someone is going to pay $100 for a razor, they deserve to be served just as such throughout every other part of their experience with the brand. It’s AVOCA Coffee Roasters investing in doing sociological research about the areas each of their unique coffees is cultivated, and working with us to create a creature and a story from the area’s history, paying homage to the people who birthed the beans they roast. It’s Greater Dallas Orthopaedics helping our team create content that educates and comforts a market full of folks who are dealing with some of the scariest diseases and infections you can imagine, giving patients peace that someone out there understands and can help them. It’s Melt Ice Creams investing in creating a Brand Storybook that lays out every single aspect of the brand’s story, mission, values, and vision, giving every future employee a very clear picture of what it means to be a part of their team and to serve their market the way they are so driven to continue doing. I could definitely keep going, but I think you get the point. Our battle cry is two-fold. It’s a challenge to ourselves that constantly reminds us how fortunate we are to be in the position we are, being trusted by so many great brands to carry their flag for them. It is also a challenge to any entity that is trying to make a difference in the marketplace to stop half-assing how it speaks and acts toward it. The marketplace owes none of us anything. It is an honor and a privilege to have the opportunity to serve it, and to reward its trust. Let’s treat it as such, together. If you’d like to learn more about what this looks like for your organization, please don’t hesitate to reach out. Whether you do business with us or not, we want you to see what Giving A Damn looks like. Our world needs it, and it deserves it.